Sergei Galperin, a native of Moscow, Russia, began violin studies at the age of five and shortly thereafter gave his first public performance in the Concert Hall of the Moscow Conservatory. After his studies at the Moscow Conservatory with professor N. Boyarsky, Mr. Galperin received his Bachelor and Master degrees from The Juilliard School, where he was a full scholarship student in the class of Dorothy DeLay and Hyo Kang. Later he earned Artist Diplomas from Indiana University and Peabody Conservatory. Mr. Galperin made his American solo orchestral debut in May 1982 at the age of 16 with the Symphony Orchestra of New York at Avery Fisher Hall at Lincoln Center. He has also performed as a soloist with the Houston Symphony Orchestra in their Educational and Pops Series, as well as with the Indiana University, Aspen Symphony, and Dallas Festival Orchestras. As a winner of Artist International auditions, Mr. Galperin made his New York solo recital debut in March 1988 at the Weill Recital Hall at Carnegie Hall. After winning New York’s National Arts Club Competition in 1987, he was featured in recital on live ABC and PBS news shows. Subsequently he appeared in recital at Alice Tully and Merkin Concert Halls at Lincoln Center. In May of 1993, Sergei won an honorable mention award as a finalist of a prestigious Concert Artist Guild competition in New York. 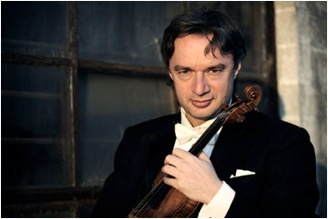 Currently a first violinist of the Houston Symphony Orchestra, Mr. Galperin has also been invited to serve as Concertmaster for the Rochester Philharmonic in New York in the 2004-05 Season, as well as the Adelaide Symphony in Australia. Prior to his current position, Mr. Galperin has performed with the Pittsburgh Symphony, the Chicago and Baltimore symphony orchestras, as well as the Grant Park, Aspen and Grand Teton festival orchestras, A. Schneider String Seminar, and Taos Chamber Music Festival. As a member of Chamber and Symphony Orchestras Mr. Galperin has toured internationally in Australia, Malaysia, Japan, Korea, Taiwan, Brazil, Argentina, and all of Europe, including festivals in Lucerne, Berlin, Vienna, Copenhagen, and Edinburgh. In the US he has performed on numerous occasions at Carnegie Hall and the Kennedy Center in Washington, D.C., in addition to Symphony Halls in Boston, Chicago, Pittsburgh, Houston, Philadelphia and many others. Sergei Galperin served as a faculty member at Duquesne University in Pittsburgh in 1999-2003, as well as a Professor of Violin at the University of St. Thomas in Houston in 1998-99 and teaching assistant at the Indiana University School of Music from 1990-1994.